One of the best things about stretching is that you don't need any equipment to do it—same thing goes for strengthening your core. So the idea of buying a piece of equipment to help me do those very things seems unnecessary, kind of like buying a kleenex holder when the tissues already come in a perfectly serviceable box. But as a gear reviewer, I'm up for (almost) anything, so when a flexibility/core strengthening gadget called the TendoFlex came across my desk, I gave it a whirl. The idea behind this gadget is that you add pressure by pulling and pushing against the bar and foot board, allowing you to get more out of the stretch or strengthening move you're doing. As it turns out, it does just that. By putting tension on the bar (you roll the cord that attaches it to the foot board to get it to the right length), I was able to gently deepen each stretch—something that both felt wonderful and gave my tight lower back and hamstrings some extra TLC. The device also made doing some of the core moves (like the reverse crunch) a little easier—not necessarily a plus in my book, but something that could be beneficial for folks who have trouble doing those moves. Be warned, though: The TendoFlex makes it easy to transfer some of the work of the move to your arms (vs. your abs) if you're not paying attention, which could make the move less effective. While the exercise booklet contains a good range of flexibility (aka stretching) and core strengthening exercises, I was surprised to discover what it doesn't contain: a single word about warming up before stretching. In fact, the booklet actually advises doing the moves right when you wake up, or before working out. But ask virtually any exercise physiologist—or the American Council on Exercise, for that matter—and you'll be told that you should never stretch a cold muscle, unless you actually enjoy the prospect of injuring yourself. I'll admit, too, that the $50 price tag threw me off. 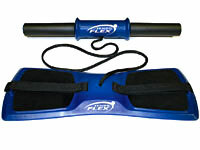 Yes, this gadget added effectiveness to my flexibility routine. But I found I could get a similar result by using a towel or yoga strap (both much cheaper alternatives) to provide tension. So it seems the TendoFlex and I are not destined for a long-term relationship. It's not a bad piece of equipment by any means; it's just not crucial to a good stretching or core-strengthening routine. And in these penny-pinching days, that's something to consider. Pros: It can help deepen your stretches and make core exercises a little easier to do. Cons: The exercise booklet doesn't address the need to warm up your muscles before stretching, and it's a little pricey for what it does. Extra tip: Looking for lower back exercises? Try those for the lumbar spine. For upper back work, do the thoracic spine moves.